I am already back in Berlin while DrJ and WonderDaughter enjoy an extra-week of holidays in Australia. 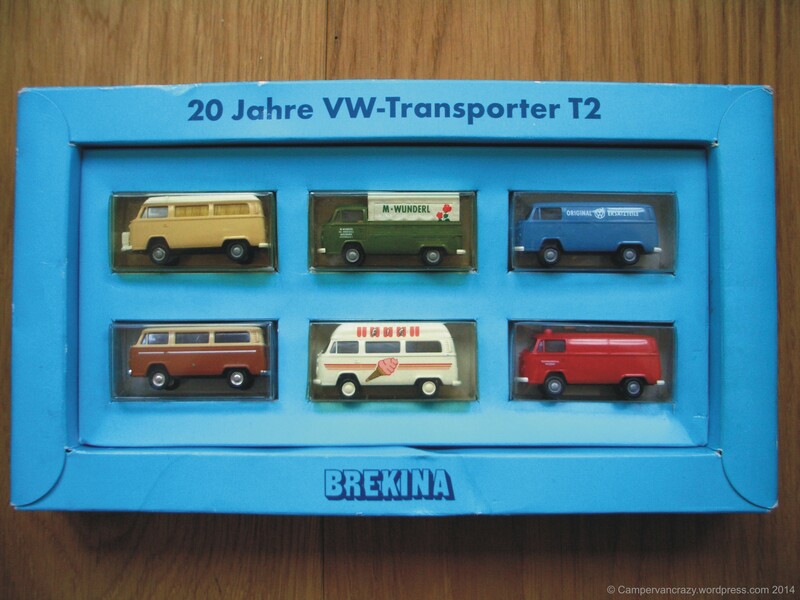 Home alone with time to unpack a recent Ebay “win”: A set of bus models in scale “HO” (1:87), produced by BREKINA and titled “20 years of VW-transporter T2”. It commemorates the twentieth anniversary of the end of the production of the bay window bus in Hanover, Germany, so should be from 1999. 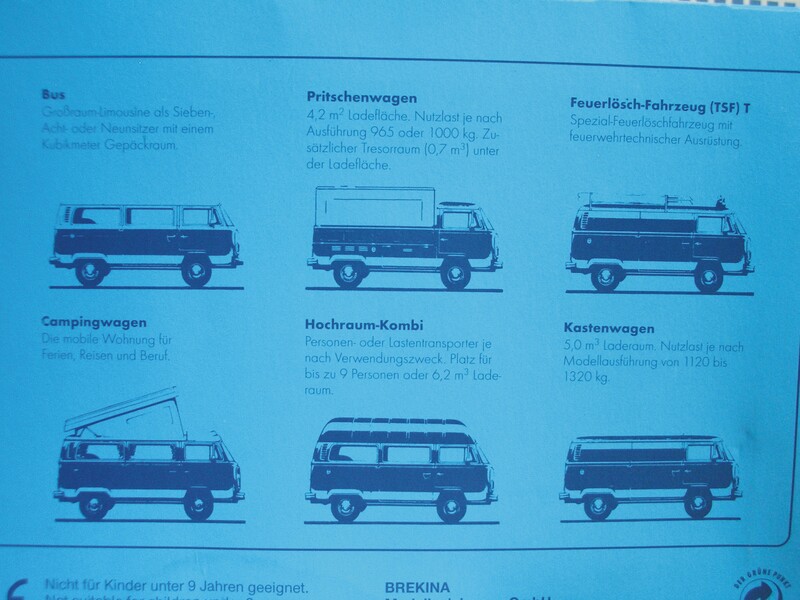 All six buses are late bay windows (or T2bs) and all appear to come in original Volkswagen bus colors, though all with different body versions: The humble panel van in neptun blue (L50K), a microbus in red-beige two-color scheme (could be panama brown, L12A), a Westfalia camper in dakota beige (L13A), a single cabin pick-up truck in sage green (L63H), a high-roof ice cream van and a red fire truck from the “Volkswagenwerk AG Wolfsburg”. Arent’ they beautiful? It took me quite some time of fiddling around with the macro setting of my happy-snappy to get the depth-of-field ok-ish. Hope you appreciate the effort! I re-discovered this beautiful piece when we sorted our study in the christmas break. 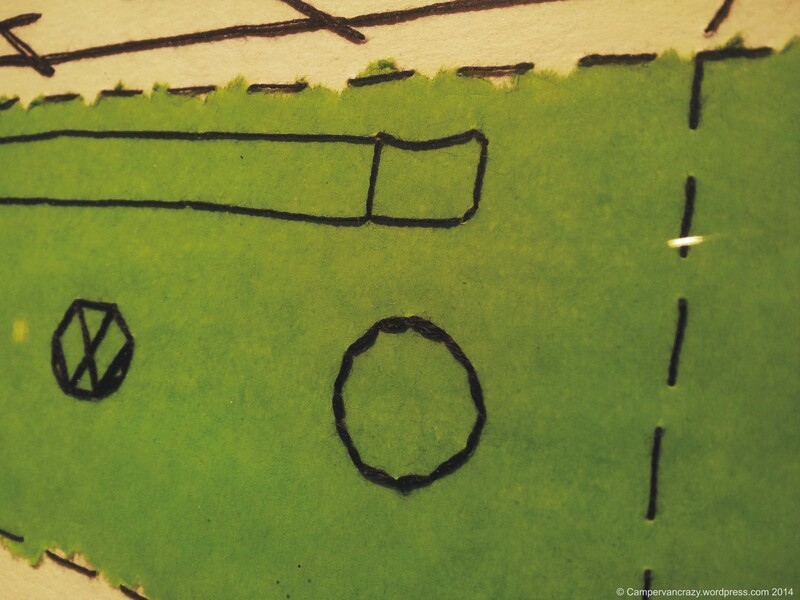 Got it as a present from DrJ who stitched it in about 2011, black thread on paper. 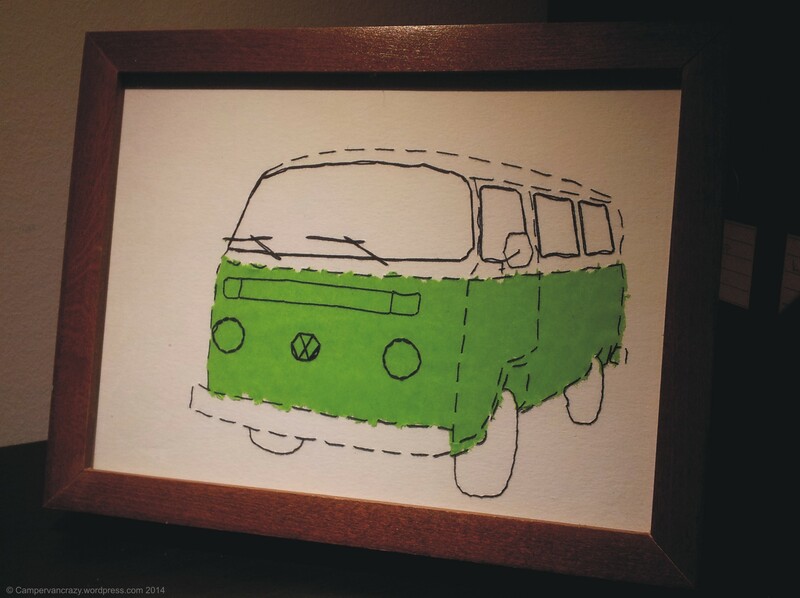 It comes in our buses’ original paint job, Taigagruen (sage green) and white. 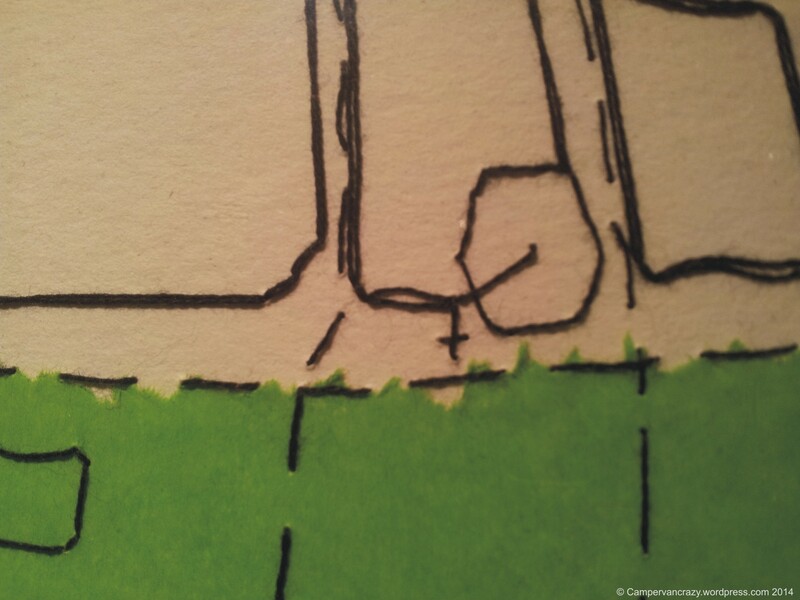 For more stitch art of DrJ check out Stitchalicious and her Etsy shop. I was in China most of last week. Very interesting, very cold, and with very polluted air. Bus-wise it was a big disappointment. Not a single campervan on the traffic-jammed streets and roads of Beijing. Lots of German cars, mainly Audis and Volkswagens, but all pretty new or brand new. 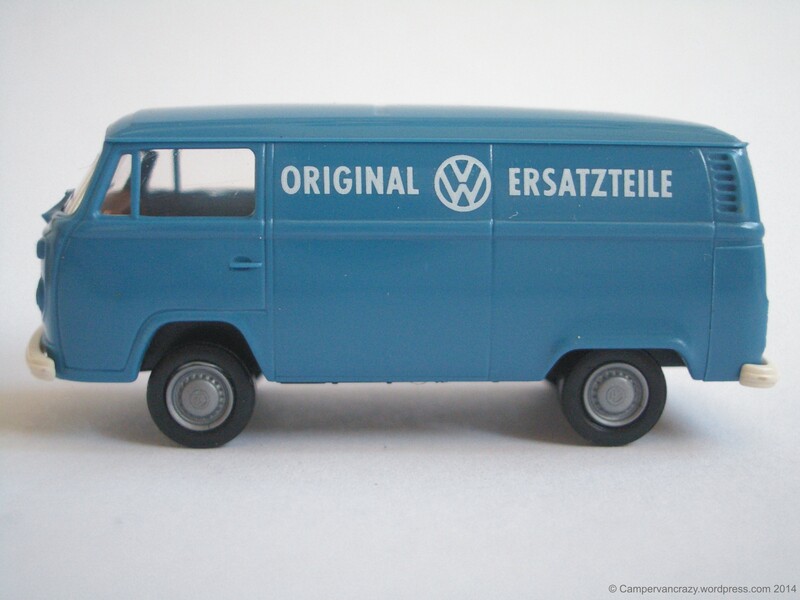 Oldest VW models were the Santanas (Passat sedans) and Jettas from the 1980ies which were built in China much longer than in Europe. 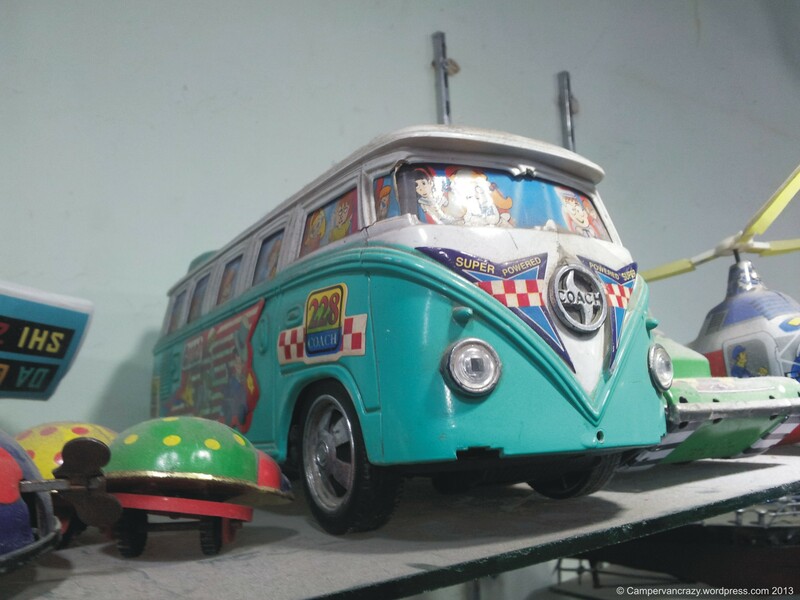 I finally got lucky in a toy shop in the Dongcheng district: A tin toy model of a split-window microbus, but with some strange “Coach” badge at the front. 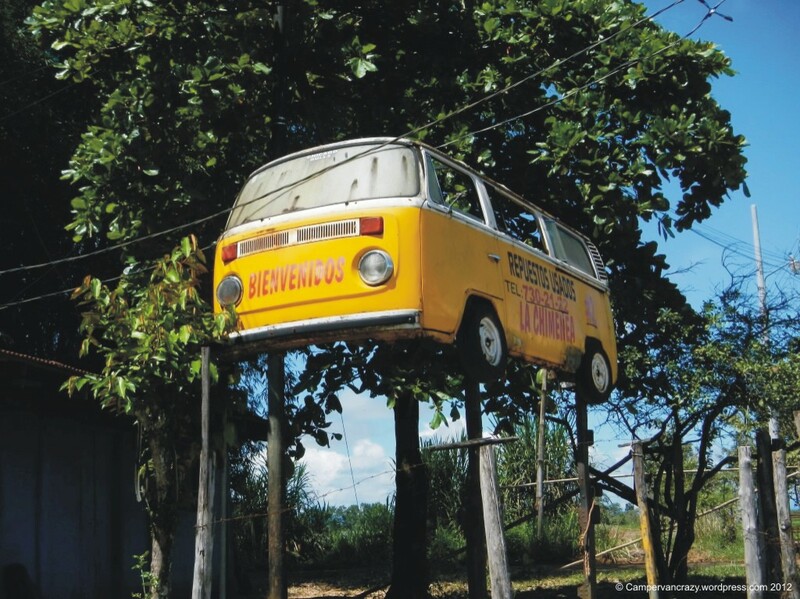 Perhaps just to avoid copyright discussions with Volkswagen? 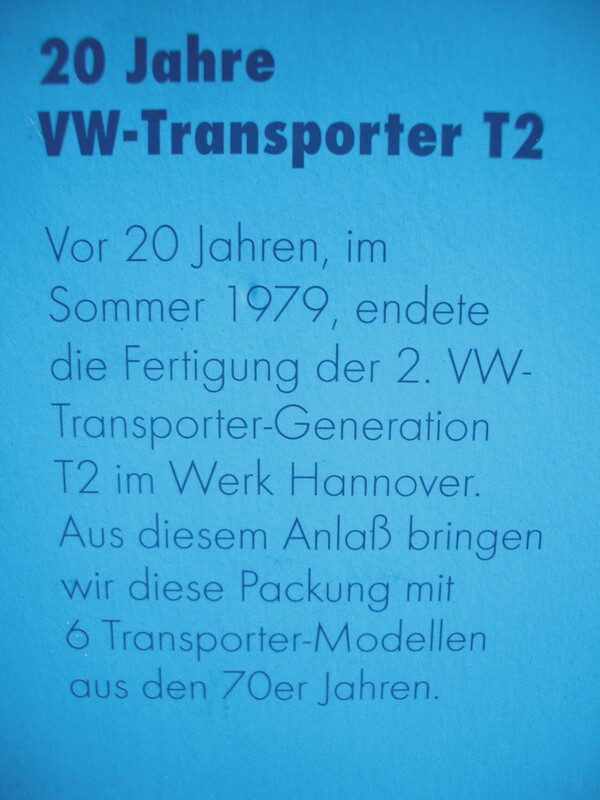 Seeing that there were some pretty amazing copies of German cars with Chinese badges on the streets, this may also be a model of a Chinese copy of the T1. Turned out it was not for sale, so perhaps also a collector’s piece of the shop owner. Here are some snapshots I received some days ago from a friend who travels through Costa Rica a lot. 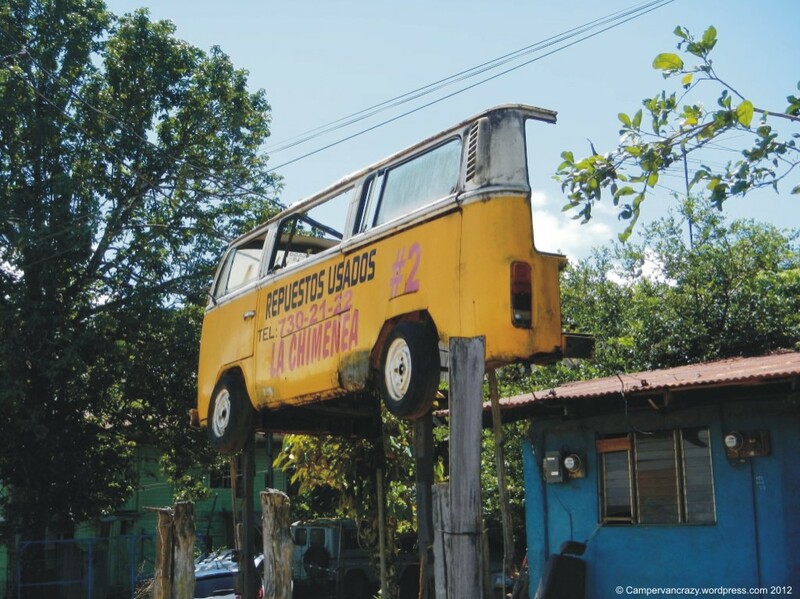 A full size T2b microbus on stilts, advertising a local used spare parts dealer. 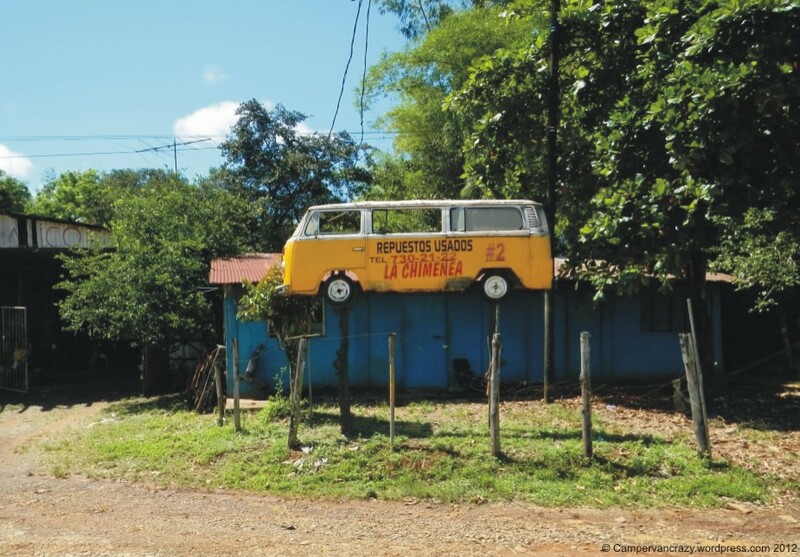 The photos were taken earlier this November in the small town of Buenos Aires in Costa Rica, directly on the Carretera Interamericana, or Interamerican Highway. Apparently that is the part of the Panamericana that connects North and South America and runs from Mexico to Panama. One realizes only on second sight that only of the front and right side of the bus are still there, the rest was chopped off. 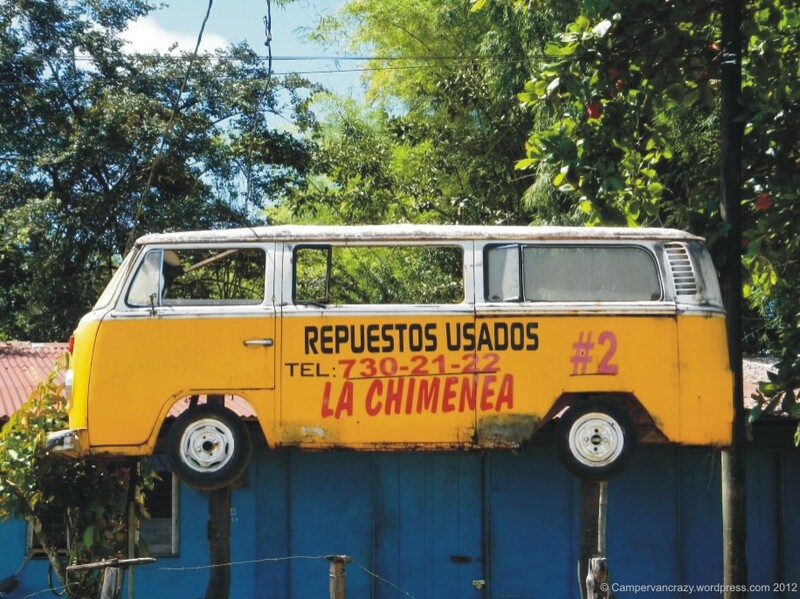 Perhaps a wreck from an accident, re-cycled as advertising billboard? Looks actually like a European or North America late bay, not like the Brazilian ones. Thanks to Siggi for these cool pictures. If you think about travelling Costa Rica and are looking for someone to organize the tour, check out Siggi’s travel blog.